I admit to spending a lot of spare time sourcing inspiration digitally; long gone are the days of living in a library surrounded by a mountain of books and yellow stickies while getting territorial over the photocopier. Digital research certainly shouldn’t stop us from leaving the house; inspiration can be found anywhere in anything, but I do see it as a huge positive. In theory, they should compliment each other well and it means I have convenient access to a constant platform of reference. Below, are just three of many artists whose work share qualities and characteristics that greatly appeal to me and offered an ongoing source of inspiration while working on the Collage brief. I’m heavily influenced by print; screen printing, etching, collagaph, letterpress are a few examples and the combination of this with collage to me is a win, win situation! In fact, work that used print as the sole media could quite effortlessly translate into collage. Eduardo Chillida (1924 – 2002) was a Spanish Basque sculptor notable for his monumental abstract works. Chillida was a very celebrated and prolific artist with works in many museums across the world. Aside from sculpting he also collaged, using bold and abstract shapes, incorporating print and other media, most notably paper. 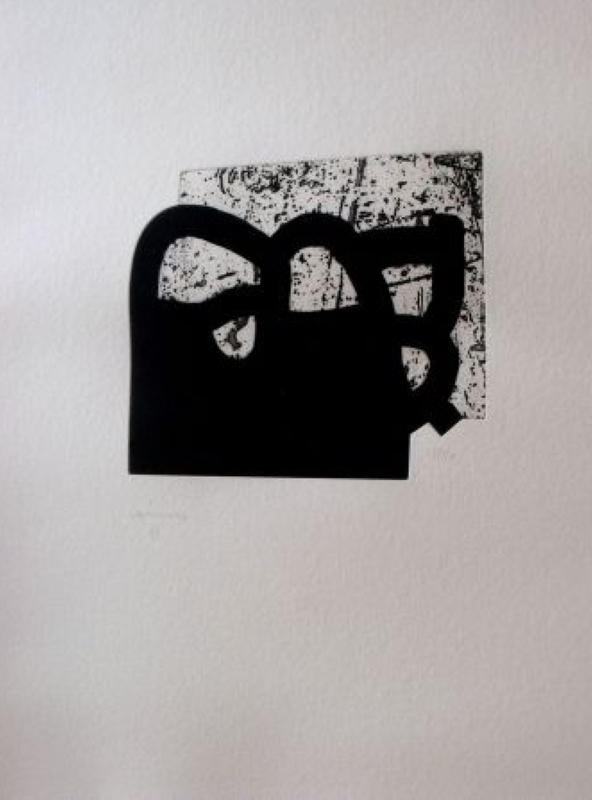 It was Chillida’s use of bold, simple marks and shapes that immediately drew me to his collages. 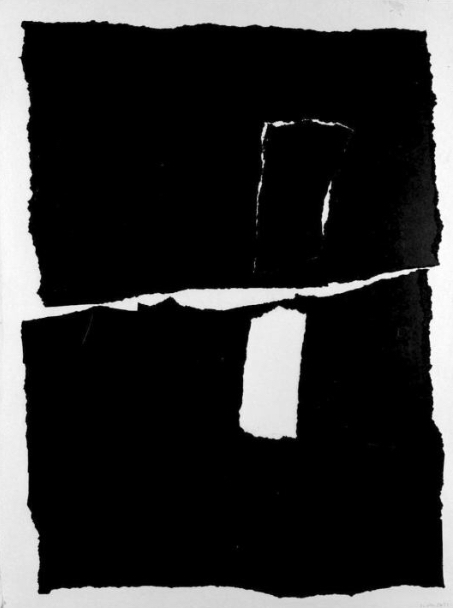 Chillida’s work is gloriously simplified and abstract with incredible bold use of predominantly black line. With shape, he utilises positive and negative space to its maximum. His collages sit in unison with his sculptures, even his etchings and aquatints had three-dimensional qualities that could have been composed from collage. He also used the process of de-bossing to create texture and add layers. Claire Oswalt is a contemporary artist living and working in Austin, Texas. Her work, consisting largely of watercolour and acrylic collage shares many qualities with Chillido’s work. 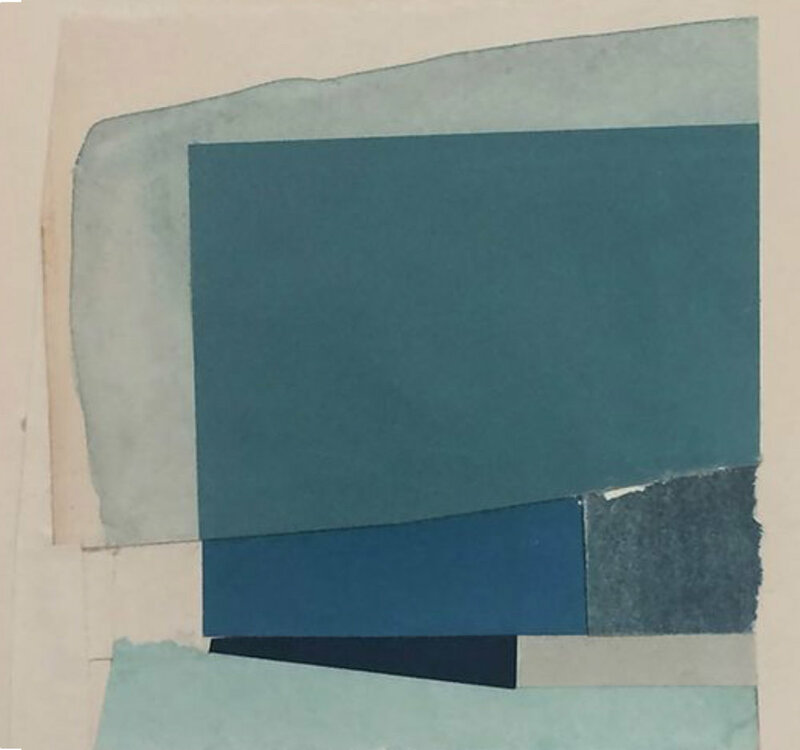 She uses a limited, simple colour palette giving a sense of calmness and serenity about her work. While some colours are subtle, Oswald’s work is by no means timid. She also uses bold black shapes and lines, sharp edges balance well with the irregularity of torn paper edges creating interesting use of negative space. Italo Valenti (1912–1995) was an Italian painter and collagist who in 1959 with the encouragement from his friend and peer Ben Nicholson, started to make abstract collages. .Valenti created his works from torn sheets of black and white paper, creating form, texture and tonal variations. These three pieces of work are on permanent display at Kettles Yard in Cambridge but initially were part of a larger group of work. They were never intended to be part of a group but these three pieces displayed as a triptych work incredibly well. The combination of black and white and organic shapes reminds me of marks achieved during the mark making exercise as part of my course. Valenti’s work has a sense of freedom with incredible boldness. Images used as reference for research only.